Everything is OK. A 23 year low in the VIX. A low reading in the VIX suggests little or less equity market volatility. It could mean that the world is OK and perhaps there is ‘smooth sailing’ ahead. To the contrarian, a low VIX could be a signal of an expected reversal, whereby the VIX rises and investor fear increases. Often, such fear translates into declining asset prices. 23 years ago (December 1993) the VIX was trading at the same level which it is today. Over the next 6 years, the VIX quadrupled. This tells us that volatility has increased but back then I don’t recall an overwhelming sentiment of fear. How we read the VIX Index is not always the same. How did the equity market react to a rising VIX? 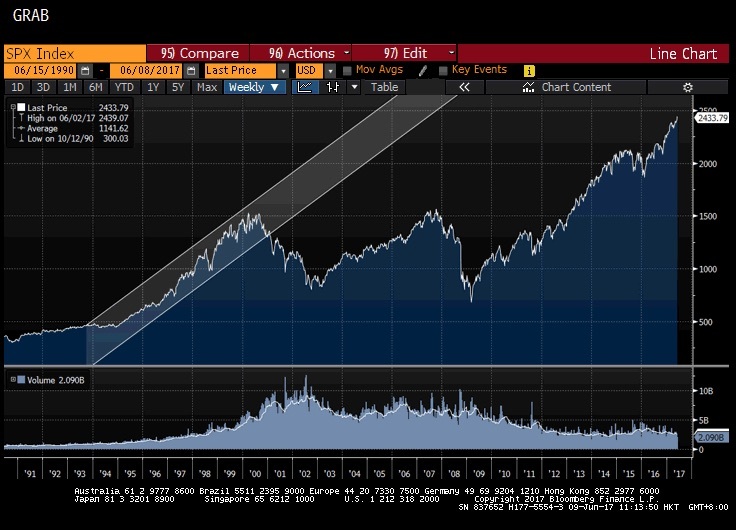 Commencing in 1993 (with subdued trading volumes) up until 1999, the S&P 500 Index (see chart below) trebled in value. In 1993, the markets were 6 years into recovery following the 1987 stock market crash and Bill Clinton was a year into his presidency. Incidentally, in December ’93, the S&P 500 was trading 43% higher than its 1987 pre-crash peak. And it wasn’t until another 3 years (Dec ’96) until Alan Greenspan made his “irrational exuberance” speech. 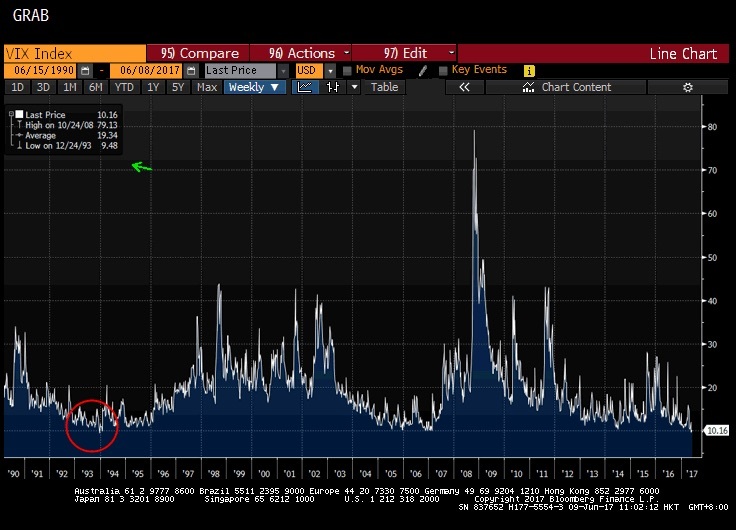 Unlike, the 2008 -2009 spike in the VIX which resulted in a sizeable decline in equity prices, the 1993-1999 period was prosperous for equity investors, even though volatility was rising or at least it was according to the VIX Index. 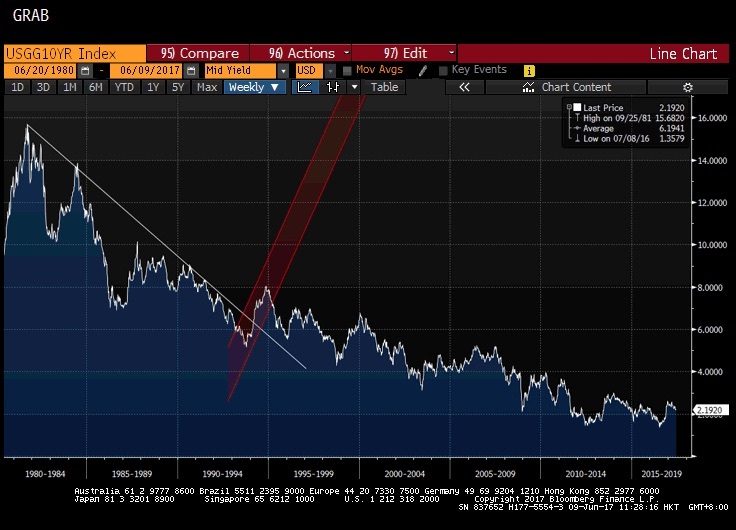 On the interest rate front, even though the yield in the U.S. Treasury 10 year bond (see chart below) shows a spike in interest rates from 5.3% up to 8% between late ’93 and late ’94, interest rates resumed their downtrend trend down reaching 4.3% in 1998. While we saw fluctuations (volatility) in interest rates, it was interesting to note that the average yield over this period was 6.2%. Even more so, the average interest rate over this 37 year chart is also 6.2%, as displayed in the data box in the top right hand corner of the image. So, between 1993 – 1999, the VIX (volatility) increased, equity prices also rose and interest rates stayed low. Today, the VIX is at historically low levels, we have subdued trading volumes (arguably with low investor participation), the S&P 500 is 8 years into a recovery following the 2008-2009 “crash” and its trading at levels 54% higher than the pre “crash” high. It is plausible that interest rates continue to stay low, that the VIX rises from its 23 year low and equity prices climb. After all, no one has made an ‘irrational exuberance’ speech.